About three seconds before Vince Molinaro steps through the door, his charisma has already arrived. But far from a bombastic personality, his presence is part childlike enthusiasm and mature self-confidence—the latter built brick by brick with one personal and professional success story after another. It’s an impressive portfolio, to be sure. Fifty-one years after the family patriarch Domenic arrived from Italy, the Molinaro Group—now headed by partners Vince (president), his brother Robert (executive VP) and brother-in-law Sam DiSanto (managing director)—has developed over one million square feet of commercial real estate and 10,000 residential units. It has also transformed the community it calls home. “They basically changed the face of downtown Burlington forever, both aesthetically and financially,” echoes New Horizon Homes president Jeff Paikin. “They’re happy to take the lead in Burlington. But they do so because it is appropriate; not because it is assumed, which speaks to the great sense of how Vince treats everyone. Molinaro is nursing a pint from an Ontario microbrewery at Earls Kitchen & Bar at Burlington’s Mapleview Mall, and the conversation is becoming more interesting by the minute. Spend 30 minutes with the 43-year-old Hamilton native and you’ll leave feeling you’re drawing from the well of life with a thimble while he’s got a bucket. Consider that this is a man who helped finance a recent docu-drama based on the life of Johnny Cash’s Canadian manager Saul Holiff. There’s also a newfound passion for muscle cars. “My buddies are heavy into this lifestyle—collecting and restoring old cars,” Vince explains. “This past weekend we left at 2:30 a.m. on Sunday to drive to North Bay to buy a 1969 Chevelle, the same model they used in the movie Talladega Nights.” Showing off his whimsical side, he is painting the car in the same black-and-gold colour scheme, replete with the No. 13 on the sides, as character Ricky Bobby’s (Will Ferrell’s) father’s car from the movie. He also partakes in an annual ‘boys’ trip to Florida, with the focus ranging from the Daytona 500 to the Barrett Jackson auto auction. Next spring he will be taking his fourth trip with a dozen friends, many of whom are also involved in the residential construction industry. The first of the biennial excursions began seven years ago when the group travelled to the Basilicata region of southern Italy, near the arch of the Italian boot. The last two involved the chartering of a 150-foot, fully staffed boat to tour Croatia, as well as Istanbul and the Greek islands. Still, it’s hard not to mix a little business with pleasure when you’re married to another OHBA member. Molinaro and his wife will be celebrating their first anniversary at the OHBA Conference in September. They met at a national conference in Whistler in 2008—Tina with TD Bank at the time, and now a principal with Inspired Mortgage Management Solutions (IMMS) in Burlington. Little wonder that Molinaro’s presidential mandate involves celebrating the merits of volunteer work within the provincial association. “We should always be looking for a way to include the locals and take advantage of the strengths of the membership,” he says. “In my formative years, I wasn’t really aware what an HBA was or what it did. But there were a few people who thought I had some merit and might be good to include in the local Hamilton HBA. I started there with social committees, then the board of directors, eventually the executive and then president. But without someone driving me in that direction, I probably would not have ended up where I am now. “And it’s not just a case of helping out the organization; it’s personal growth,” says Molinaro. “It makes you a better businessman; knowing the builders and subtrades, but also getting to know presidents of big companies, politicians at all three levels of government and learning the issues firsthand. It’s makes you a better advocate for your company. You can send people to school and one-off courses, but the OHBA is a perfect grassroots way to grow up and mature as a businessperson. $1 million toward capital improvements at Joseph Brant Hospital—an act that triggered further donations from the private sector. That kind of commitment is in the DNA of the Molinaro Group. “We adopted a lot of the practices and people my father has used for decades,” says Vince. “My dad’s very loyal. It’s almost like a partnership. You’re relying on each other for their business. Maybe we’re paying a little more here or there, but at the end of the day it’s quality work. And we’ve kind of grown up together doing the same things our dads did, building on those same relationships, some of which go back more than 30 years. 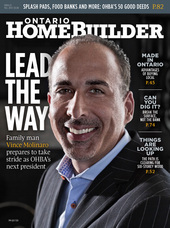 In that respect, OHBA’s next president is ideally suited to negotiate the road ahead. And knowing Molinaro, he’ll do so with a keen eye and a smile on his face.